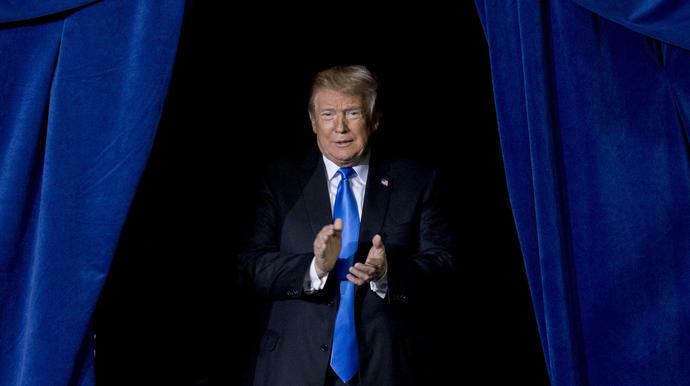 President Donald Trump has raised more than $100 million for his re-election effort in 2020, less than two years after he took office, according to campaign finance disclosures filed this month. Trump's campaign and two joint fundraising committees with the Republican National Committee raised more than $18 million in the quarter between July and September of this year, according to filings with the Securities and Exchange Commission. Together with those groups - Trump Victory and the Trump Make America Great Again Committee - the president has raised at least $106 million since January 2017 and ended last month with more than $35 million cash-on-hand. The figure is remarkable in that Trump is the first president in modern history to begin fundraising so early in his first term. He technically launched his 2020 campaign the day of his inauguration and officially said he'd run once more this February, 980 days before the next presidential election. He has been holding campaign-style rallies and soliciting donations ever since. Lara Trump, the president's daughter-in-law and a senior adviser to the Trump campaign, said more than 97 percent of the donations in the quarter were "low-dollar" amounts of $200 or less. "After twenty months in office with unparalleled results for peace and prosperity in America, President Trump has provided the results he promised," Trump said in a statement Monday. "Grassroots America has responded to these remarkable results and the booming Trump economy with their generous support of our campaign." The campaign has also been spending at a renewed rate ahead of next month's midterm elections, cutting checks for more than $7.7 million during the quarter. That figure is double what the Trump camp spent in the previous three-month period. The major fundraising efforts haven't been limited to the Republican side. Democratic candidates have out-raised many of their GOP opponents in tight House races going into the midterms, relying on small donations in an effort to help the party gain control of one or both house of Congress, according to The New York Times. Rep. Beto O'Rourke, the popular Democrat challenging Republican incumbent Sen. Ted Cruz in Texas, was the biggest fundraiser last quarter. Supporters donated more than $38 million to O'Rourke's effort, about triple what Cruz collected. President Trump referred to parts of the report as "bulls---," but did not elaborate. Democrats say Special Counsel Robert Mueller&apos;s report shows why Congress needs to hear from him directly about whether President Trump obstructed justice. Attorney General William Barr released redacted version of special counsel Robert Mueller&apos;s 400-page report to Congress and the public on Thursday. President Trump tweets ahead of Robert Mueller report, saying in Game of Thrones tweet, "Game Over." ABIDJAN, Ivory Coast (AP) - On a trip to Africa to promote women's economic empowerment, Ivanka Trump said Wednesday the White House should be judged by its actions toward a continent that her father has privately disparaged. Alexandria Ocasio-Cortez: I invited Barr to the Bronx to talk climate change. He said no.